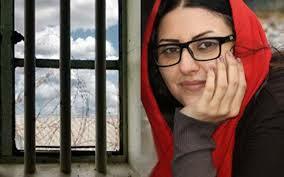 Political prisoner Golrokh Ebrahimi Iraee remains hospitalized in Revolutionary Guard Corps (IRGC) Baghyatollah Hospital in Tehran after a hunger strike that has stretched past 70 days. Since entering the hospital, Ms. Iraee has refused intravenous nutrition, stating that she wishes to continue her hunger strike. 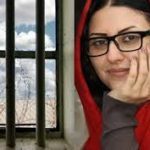 Ms. Iraee, began her hunger strike in objection to her illegal transfer from Evin Prison to Qarchak prison (criminal ward), for expressing support for last December’s national uprisings in Iran. The former chicken farm is overcrowded, and its prisoners are subjected to appalling conditions, including lack of food and clean water, no access to medical care, and poor ventilation. Violence in the facility is rampant, and there have been reports of violence between prisoners as well as frequent attacks by wardens. After 70 days of hunger striking, Ms. Iraee has lost almost 50 pounds and faints often. Other health problems, including swollen legs and kidney issues, further endanger her life. On April 8th, Ms. Iraee’s father was finally allowed to visit her in the hospital after being previously turned away. Security conditions were heavy during the visit, during which Ms. Iraee expressed her intention to continue her strike. Hunger strikes have become common among political prisoners in Iran, who often feel that they have no other way to raise their voices against the oppressive regime. Harsh prison sentences and torture are routine for those who speak against the fundamentalist mullahs currently in power. Ms. Iraee was punished not for public speech or actions, but for her private writings. Many prisoners at Gohardasht Prison in Karaj and the Central Prison of Orumiyeh in northwestern Iran have sent letters of support to Ms. Iraee as she continues her protest. In their letters, they lauded her resilience and strength in the face of oppression. The ruling regime has responded to the recent widespread uprising with harsh attempts to suppress its citizens, but the people continue to demand change. During the recent uprising, people chanted “down with the Supreme Leader” and “down with Rouhani”. Despite efforts of the Iranian regime to silence the people, the cries for freedom have become too loud to ignore.